It was the best of times, it was… well, it really was the best of times! Also, as the famous line from Dickens goes, it was the age of wisdom, the age of foolishness and the season of… Softbank Mobile. Looking back on 2006, it’s hard to decide which news from Japan’s mobile scene was the most spectacular. Vodafone pulled out, Softbank stood up, mobile number portability struck like a tsunami, a record number of new handsets hit the street and – as December winds down – Motorola’s Razr is the first foreign-made 3G celly to win massive market popularity (according to Moto, that is – we bet Samsung’s 709SC – at 12.9mm think – will outsell the Razr). Here’s a quick look at what caught WWJ’s attention in ’06. KDDI Introduces Seven New 3G Handsets – Toshiba’s W41T arrives with Japan’s first built-in 4GB HDD. Naked News for Japan Mobile – those frisky Canadians – plus some frisky locals – announce plans to take it all off on Japan’s small screen. Japan Rail Launches Mobile Wallet Phone Service – JR’s Mobile Suica service fails to impress due to the bizarre requirement for users to also have a JR credit card (this was quietly dropped later in the year). KDDI/au’s Competitive Edge in Japan – KDDI’s au 3G service continues to rock Japan with a sharp focus on the local customer, while D and V lose ground overseas. New W950i Walkman Phone – Sony’s namesake to their glorious Walkman of former times sells pretty well outside Japan, too. 3G Mobile Future: Exclusive Interview with Tomi Ahonen – one of the industry’s best analysts tells why Japan mobile rocks (later in 2006, Tomi relocates to Asia in part to be nearer to the center of this planet’s mobile action…). 3D Moji Mail – Icing on the Cake – mobile mail using e-moji mini icons – a highly used feature on Japan’s ultracool mobiles – goes 3D. Samsung 3G Handset in Japan – Vodafone brings in the second Korean handset, catching KDDI and DoCoMo by surprise (KDDI was first with a Panatech model in late 2005). Vodafone Japan’s Final Media Briefing: Out with a Whimper – The end is near for the boys from Newbury (… and WWJ’s video report is promptly posted W/O APPROVAL on YouTube). DoCoMo’s Mobile Credit Card Launch – The future of mobile services in Japan arrives with a Kaa-ching! (“Will that be cash or chargex DoCoMo?”); Big D admits to over a million registered users by year’s end. Vodafone Launching Sharp 904 – With the first phone LCD screen to have VGA resolution. Are there any phones with more gorgeous displays than Sharp’s? Japan Launches Digital TV for Mobile Phones – The future arrives – again. OneSeg services are still in beta, however, as the regulator disallows mobiTV advertising for the first couple of years. DoCoMo Quadruple Play Includes Windows DRM, HSDPA, 7 New Credit-Card Phones – Finally! The first-ever substantial tie-up between Redmond and DoCoMo, with the F902iS supporting both Windows Media Audio and Windows Media Digital Rights Management for Portable Devices. The two giants continue to eye each other warily. Vodafone K.K. Announces Nokia WLAN Handsets – Nokia’s E60 & E61 business devices finally wade ashore (DoCoMo later launches the BlackBerry – another frisky Canadian import). 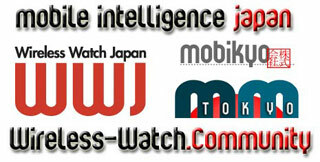 Mobikyo KK Launches Wireless-Watch.com – Mobile Media Publisher Platform – WWJ’s parent Mobikyo KK launches a new mobile news platform; by year’s end, 29 insightful publishers have joined the site. DoCoMo Brings Blackberry to Japan. Who Cares? – No Japanese text input at launch appears to seriously hobble this E-series and Zero3 competitor. DoCoMo says it’s on offer for “foreign customers” who, presumably, can’t input Japanese text anyway. Willcom Announces New Zero3 Smartphone – One of the world’s best mobile-enabled PDAs gets even better! Who can compete with 256MB or RAM, Win Mobile OS 5.0 and a substantially perfect 640×480 display? Certainly not D, V or K… And Willcom offers cheap flat-rate data, too! Gaming Set to Repeat Mobile Music Success – WWJ predicts mobile gaming to be the Next Big Thing. We were correct (of course!) in terms of usage; now if those deep-pocketed carriers will just take our advice and figure out how to combine game devices with wireless. Wireless Watch Japan Video Gallery – Lawrence Cosh-Ishii, WWJ’s ever-innovative digital media guru, posts a not-to-be-missed Flash video gallery from the Wireless Japan event. NEC, Panasonic and TI Form Handset JV – “We have to take advantage of economies of scale, otherwise we cannot survive.” The 3G keitai manufacturing business is getting reaaal tough. DoCoMo Shows Sound QR Technology – A very cool technology that can insert data in broadcast signals – in music and voice – which can be translated by enabled mobile phones into text messages and URL links. One to watch in ’07. Japan Mobile Marketing Survey Results – The good folks at InfoPLANT find that the majority of respondents to a mobile marketing survey reported using mobile coupons or discounts at least 2-3 times per month. Marketing and sales promotion via mobile in Japan is one of this country’s little-reported success stories. Mobile Entertainment Forum Presentations on Video – MEF presentations from NaviBlog, later one of Red Herring magazine’s “Asia 100” top start-ups. OhmyNews Japan Debuts – Citizen journalism comes to Japan… but only available via mobile at year’s end. SoftBank Mobile Comes Out Swinging – Vodafone’s dead; Masayoshi Son issues 12 press releases to announce the 1 Oct start of SB Mobile, with 13 new handsets and a bucketful of cheap pricing tariffs. DoCoMo Mobile Credit: Everything You Know About 3G is Useless – WWJ fearlessly predicts that DoCoMo’s DCMX isn’t merely the the ‘Next Big Thing’ – it’s everything; and it’s going to make 3G itself redundant. We expect 2007 to prove us right. M-Commerce Convergence Announced – The big players in FeliCa IC chip-based services (DoCoMo, JR and bitWallet) agree to merge their until-now separate platforms to ease consumer confusion. It’s about time. 3G Phone Checks Drunk Drivers – Is there any way in which DoCoMo doesn’t make our society a better place to live? Phone Alerts Couples to Baby-making Window – It will also remind them when it’s OK just to practice..
NTT DoCoMo Announces New 3G, HSDPA Phones – Part of Big D’s record-breaking, 50-plus-handsets release year. New models include, for the first time, Chaku-uta Full music downloads, a couple years after KDDI. Japan’s 1st Mobile Phone Novel Awards – First-prize winner: a story of pure love between a schoolgirl prostitute and a host club gigolo. Towa, the pen name of the author, received 1 million yen and the right to publish “Kurianesu,” her story about unlikely love. KDDI Announces Digital Radio Services – They’ve already had huge success with analog services, launched initially with TokyoFM. Japan Mobile Music 3Q Results – The Record Industry Association of Japan announces results for 1 July – 30 September, including a whopping 201% year-on-year increase in sales for full-track downloads. Digital TV for Mobile in Japan – 1H Review – We report that the ministry, carriers and broadcasters have carefully developed a strategic long-term vision for the successful deployment of mobile TV in Japan. SoftBank Mobile Subscriber Stats – SB avoids reporting a net loss in subscribers by fudging the reporting period by extending the period for which it counts inactive users from six months to a year (this allows inclusion of prepaid subscribers who had not used their mobile phones for nearly 12 months). DoCoMo Announces i-mode for India – Looks like Big D isn’t doing so badly overseas after all. At least – doing badly or not – they aren’t giving up..!! We’re looking forward to a fantastic year in 2007 and will be reporting closely on DoCoMo, KDDI, Softbank, HSDPA, IPMobile, eAccess, m-commerce, 3G, i-mode, music and many other key topics. From Lawrence, myself and the rest of the folks at Mobikyo KK: Thanks for following WWJ and we look forward to serving you again next year!